BANFF, AB, Aug. 2, 2018 /CNW/ - As a recognized leader in conservation, Parks Canada is committed to the recovery of species like the plains bison. Wild bison once roamed the valleys of Banff National Park, but they hadn’t been seen in over 140 years. That all changed in 2017. On July 29th, 2018, the enclosed pasture in Banff National Park's backcountry that housed the wild plains bison was opened and the herd was successfully released. The Banff herd currently totals 31 bison and is comprised of 16 bison that were translocated from Elk Island National Park in 2017, as well as two generations of Banff-born calves (some of this year's calves have yet to be born). For the next three years, Parks Canada will closely monitor the bison as they explore their new home within a 1,200 km2 reintroduction zone in the remote eastern slopes of Banff National Park. Here they will interact with other native species, forage for food, and begin to fulfill their missing role in the ecosystem. At the conclusion of the reintroduction pilot project in 2022, Parks Canada will evaluate the success of the project to determine if long-term bison restoration is feasible in Canada's first national park. Bison are an icon of Canada's history. They were an integral part of the lives of Indigenous peoples and Canada's pioneers, and they still have an important role in the culture of Indigenous peoples. In addition, plains bison were historically dominant grazers that helped shape the ecosystems of what is now Banff National Park. The restoration of wild bison in Banff returns a keystone species to the landscape, fosters cultural reconnection, inspires discovery, and provides stewardship and learning opportunities for residents and visitors. "This is a historic moment. Not only are bison a keystone species and an icon of Canada's history, they are an integral part of local Indigenous culture. By returning plains bison to Banff National Park, Parks Canada is taking an important step towards restoring the full diversity of species and natural processes to the park's ecosystems – while also providing new opportunities for Canadians and visitors to connect with the story of this iconic species." Canada's national parks are gateways to discovering and connecting with nature. In managing national parks, Parks Canada maintains or restores ecological integrity, and provides Canadians with opportunities to discover and enjoy them. Bison herds once numbered as large as 30 million across North America, but they nearly became extinct within a single human lifetime. Although many factors led to their near-disappearance, over-hunting was the main cause that left fewer than 1,000 bison. For thousands of years, bison roamed the Great Plains, the eastern slopes of the Continental Divide, and the valleys of what is now Banff National Park. They disappeared from this area around 140 years ago, but they left behind clues such as ancient wallows and bones that we still find today. The number and distribution of animals in the Banff area is thought to have been heavily influenced by Indigenous peoples who, in addition to hunting bison, actively burned forests and meadows which improved habitat quality. Bison in the Banff area did not travel in the vast herds that were common on the plains, but even in low numbers, as the historically dominant grazers, they helped shape the ecosystems that we enjoy today. Bison are keystone species; they alter the landscape in ways that benefit many other plants and animals ranging from bugs to birds to bears. as North America's largest land mammal, bison provide a rich source of nutrients for scavengers, bears, and wolves. For over a century, Parks Canada has been an international leader in bison conservation – helping bring bison back from the brink of extinction. Parks Canada's leadership in bison conservation started in 1897 when Banff National Park (then Rocky Mountains Park) protected some of the few remaining wild bison left in North America as a display herd (the enclosure and the bison were removed in 1997 to facilitate wildlife movement around the Town of Banff). In the early 1900s, 700 plains bison from the last wild herds were bought by the Government of Canada from a rancher in Montana. The bison were shipped north to Elk Island and Buffalo national parks. Buffalo National Park (near Wainwright, Alberta) closed thirty years later due to disease, overgrazing, and lack of funding, but the bison in Elk Island National Park thrived. They are now the primary seed stock for reintroduction projects around the world, including Montana, Alaska, and Grasslands National Park. Parks Canada manages bison at six other national parks across the country: Elk Island, Grasslands, Prince Albert, Wood Buffalo, Riding Mountain, and Waterton Lakes national parks. The 2010 Banff National Park Management Plan states that Parks Canada will "re-introduce a breeding population of extirpated plains bison, a keystone species that has been absent from the park since its establishment, and to work with stakeholders and neighboring jurisdictions to address potential concerns through joint management strategies before reintroduction." Parks Canada has committed $6.4 million to reintroduce a herd of plains bison in Banff National Park as a five-year reversible pilot project to test the feasibility of managing wild bison in Banff. In developing the reintroduction approach, Parks Canada reviewed the best-practices for successful reintroductions, experiences of other national parks with multi-jurisdictional management of free-ranging bison, and conferred with technical experts and stakeholder groups. In 2017, Parks Canada made history by reintroducing a small herd of plains bison into Banff's eastern slopes. Their return is part of a five-year pilot project (2017-2022) to inform decisions about long-term bison conservation in Banff National Park. In early 2017, 16 healthy bison from Elk Island National Park were translocated to an enclosed pasture within the reintroduction zone located in Banff's eastern slopes. The bison spent two calving seasons in the soft-release pasture – allowing them to bond to their new home. In the spring of 2017, ten new calves were born in Banff National Park. The bison were closely monitored and cared for by Parks Canada during this phase. In summer 2018, the bison were released and are now free roaming. Mountain ridges and short stretches of wildlife-friendly fencing will discourage bison from leaving the 1,200 km2 reintroduction zone while allowing other wildlife to pass freely. Parks Canada will now monitor the herd and its influence on the landscape. At the end of the 5-year pilot project in 2022, Parks Canada will complete a review to determine whether longer term bison restoration in the area is possible. Why Bring Bison to Banff? As a keystone species bison influence the landscape in ways that benefit many plant and animal communities. Bison are an icon of Canada's history. They were an integral part of the lives of Indigenous Peoples and Canada's pioneers, and they still have an important role in the culture of Indigenous Peoples. Restoring bison to the landscape is an opportunity to renew cultural and historical connections. Successfully reintroducing bison will create new opportunities for visitors, neighbours, and the public at large to learn about the ecological and cultural importance of bison. Parks Canada manages one of the finest and most extensive systems of protected natural and cultural heritage areas in the world. In managing national parks, Parks Canada maintains or restores ecological integrity and provides Canadians with opportunities to discover and enjoy them. Integral to this work is restoring the full suite of native species, and natural processes, to these special places that make up the national park system. This helps ensure that our national protected areas will remain healthy and vibrant for present and future generations to appreciate and experience. 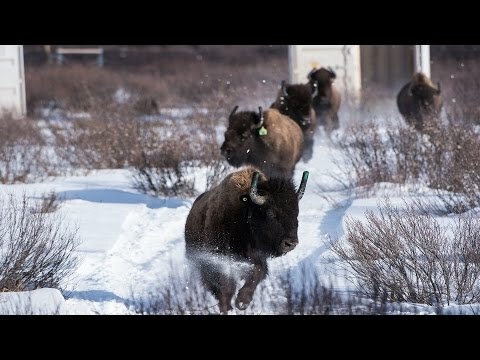 Parks Canada successfully translocated 16 plains bison from Elk Island National Park to a 16-hectare soft-release pasture in the backcountry of Banff National Park on February 1st, 2017. The ten pregnant females in the herd gave birth to 10 healthy calves (7 females and 3 males) in the spring 2017 (the first on Earth Day). On July 29th, 2018, Parks Canada released the herd of 31 bison into the backcountry of Banff National Park. This marked the beginning of the free-roaming phase of the project which spans until 2022. Parks Canada will continue to closely monitor the herd and their interactions with the landscape and other native species throughout the duration of the pilot project. Throughout the reintroduction project, Parks Canada is committed to providing a range of opportunities for Indigenous people, Canadians, and visitors from around the world to share and celebrate the bison reintroduction story. As of summer 2018, this has included Indigenous blessing ceremonies in Banff and Elk Island National Parks, homecoming celebrations for the public, interpretive programming, and youth engagement activities. We have also launched a Bison Blog and started a YouTube web-series. The bison reintroduction to Banff has been and will continue to be built through collaboration and cooperation, and its future success relies on involvement of Canadians, Indigenous peoples, and stakeholders. Reintroducing a breeding population of plains bison to Banff National Park was first introduced to Canadians in the 2010 Banff National Park Management Plan, where it received overwhelming support. In 2012, a genuine and meaningful consultation process on the reintroduction of plains bison to Banff National Park began. Throughout the consultation process, Parks Canada received high levels of support for the reintroduction and integrated key contributions from reviewers that helped re-shape and strengthen this important project. Canadians were also invited to comment on the Detailed Environmental Impact Analysis of the Reintroduction Project in 2016. These comments helped inform the final reintroduction approach.